It was the mid-engine Porsche coupe many enthusiasts had been clamoring after for years, and the Cayman GT4 delivered. Big time. 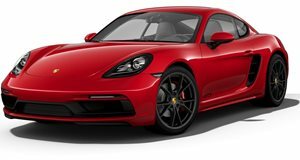 With its naturally aspirated 3.8-liter flat-six derived from the 911 Carrera S, six-speed manual and a lightweight of 2,950 pounds, the Cayman GT4 takes some of the best bits from other Porsches (its seats are very similar to those found in the 918 Spyder, for example) and, combined with Brembo brakes and other touches, makes for one of the best all-around street-legal track toys on the market. Carfection was just reminded of how incredible the Cayman GT4 is in only three track laps, and therein lies the problem for many anxious buyers: it’s sold out. Furthermore, prices for used examples are currently soaring. Originally based at $84,600, a quick search will reveal current prices above $100,000. Say $115,000 to be safe. Unless you’ve got that kind of dough laying around, you’re not going to get a GT4 no matter how much you try and beg. Sellers know Porsche created something special and with a very limited production run. It’s a perfect recipe for inflated pricing.